The Tusk bearing race and seal driver is a great time saving tool to drive bearing races, and seals into their proper locations. Each driver is constructed of billet aluminum to be lightweight and durable. The driver handle is 4 ¾" long and is also made up of billet aluminum. The kit contains 6 driver sizes and will accommodate both tapered and flat type bearings. When in need for the proper tools to get the job done on your motorcycle, ATV, or UTV, think Tusk! Bearing and seal driver kit used to drive seals and bearings on your motorcycle, ATV, and UTV. Contains 6 double sided drivers for flat or tapered type bearings. Sizes include 40mm (1.565"), 44.5mm (1.75"), 50mm (1.965"), 60mm (2.325"), 63mm (2.47"), and 65mm (2.55"). Constructed of billet aluminum to be lightweight yet durable. Includes a 4 ¾" long billet driver handle and a convenient storage case for the kit. Works great, don’t have to worry about damaging seals a bearing races anymore. The Tusk Bearing Race and Seal Driver Kit worked well, previously I had purchased the Tusk Bearing puller and it worked good as well. I think Tusk tools are very good quality as well as a value for the money. It seems like you could go without this tool by just finding misc. objects or tools and using them as a bearing driver, but after using this, it makes things go a lot quicker and more smoothly. Works great for my bike. Easy to use and the case is a lot smaller than the picture makes it look. Nice build quality, fit and finish is great. Only issue I had was fitment on the race I was driving was a little off, I had to be very careful to hold it square. But for the money it can’t be beat. I would buy it again no question. Grear bearing & seal driver kit! 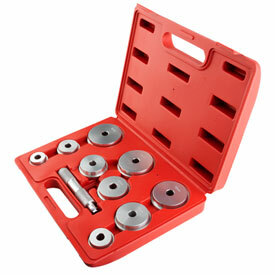 The Tusk bearing seal driver kit is a great value for the money. I work on vintage motorcycles mostly and im always doing wheel bearings. Never had a problem getting bearings out but getting them in straight can be tricky this kit makes it easy. Getting those bearings in evenly without causing damage to them is extremely important. This makes it a breeze. Couldn't finish my bike without this. I'm restoring a vintage Kawasaki 2-stroke, and needed to change the crank bearings and seals. One of the crank seals was huge - bigger than my largest 1/2" drive socket. This kit provided a die that was exactly the same size, and I drove the seal in with zero damage. Holding up very well, price was right. Sizes are much more useful for ATV/MX than the usual automotive bearing driver sizes. BEST ANSWER: Sorry, I don't have a definitive answer for you for that specific model. I purchased the kit in anticipation of a need for them and still have not had the opportunity to use them. I would assume that they will work for your application given there are many sizes included and the price is very reasonable. Again, sorry for not having a better answer. This set of drivers has worked on several different size bearings that I have installed including stem bearings, there should be a size included that will work on your CR250. these are the sizes that it includes. Yes. I have used this kit on honda's, ktm's and yamaha's. Just pick the size you need and hammer away. Great sturdy kit. Will this kit work with the 250F bikes steering bearings? BEST ANSWER: I wanted to check but I just sold my bike and gave the new neck bearings away with it. For the price, it will come in handy for lots. I dont see why it shouldnt, it comes with various sizes to remove a wide varity or bearings and races and even rwinstall them. I'm not sure, I've never tried it?